etariat Wednesday exhibits some of locally sourced products done by corps members serving in the state. This according to the scheme was to compliment efforts of the federal government to provide employment opportunities for the teeming young Nigerian graduates through Skills Acquisition and Entrepreneur Development (SAED) programme of NYSC. The scheme’s Coordinator in Kaduna State, Prince Mohammed Momoh, told Daily Sun that as largest body of youth motivator in the country, the NYSC is ready to make corps members job creators instead of just job seekers as the case has been before now, adding that the scheme is ready to partner genuine individuals and organizations in that direction after intensive fact checkings. On how to ensure standard of home-made products he said, “Let get started first and then we continue to improve on it after the tooting stage. You can not compare products that will be producing by graduates to others in term of efficiency and what have you. 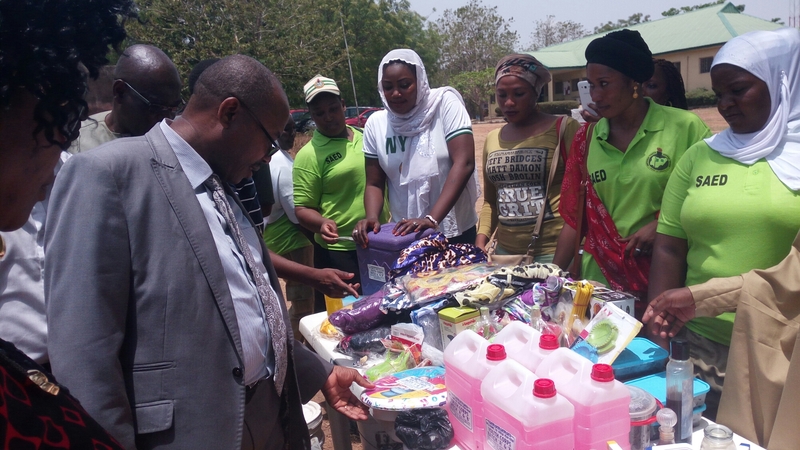 Prince Momoh further urged corps members to take advantage of attention the need for the country to patronise local products is currently generating to better their lot and that of their family and their host communities. Assistant Director of SAED, Mrs. Ifeanyi Odimpa, said the Central Bank of Nigeria has adopted Heritage Bank as the sole pilot bank for the Youth Innovative Entrepreneurship Development Programme (YIEDP), which she said is opened to both serving and ex corps members who serve within the last five years and between ages 18 to 35 years. According to her, interested corps members can process up to N3million while group of 3-5 can access up to N10million as seed capital after they must have submitted a well written proposal and their NYSC discharge certificate as collateral. The loan is to be repaid with single digit interest rate up to three years. A 2025 batch ‘A’ corps members, Ibrahim Hassan, testified that he was discouraged earlier but later develop interest in the programme and can now depend on the skills he had acquired in his one year mandatory service to his motherland. Also, a graduate of Industrial Mathematics from Federal University of Technology, Minna, Niger State, Juliana Audu, as a great woman she wanted to be in live, she has learnt to take her destiny into her own hand by fully involved in the SAED programme. “When we started, we have no skill. But we put on the courage and we are good to go now pending the time the desired while colar job will come, that if it does,” she said. The programme has various vocational fields include agro-allied, ICT, automobile, welding and fabrication, food processing, poultry among others.